Titanium nitride coated bits last up to six times as long as uncoated bits. 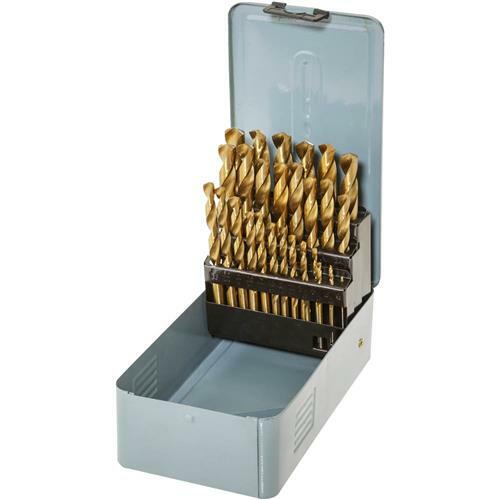 29-piece set includes bits ranging from 1/16" to 1/2" in increments of 1/64". Housed in rugged steel case. I bought this to update my drill set. The drills are fine, but the markings for the small drills are mostly illegible, which is inconvenient if you choose by specific size. Product arrived damaged. Grizzly replaced it fast and without issue. I purchased the set to replace an older worn out set of bits. So far, so good. I bought it on sale and so glad I did . It was nice set. All the tools bought from Grizzly I use and enjoy thank you.